What is important to understand about models is that each has their own assumptions, which, like in economics, rarely hold true. These models are useful to explain underlying factors that influence behaviour; however there are multiple external factors that may also be in operation at any given time, with only some models taking these into consideration. Factors are not barriers (i.e. simply changing factors will not lead to desired behavioural outcomes. People need to be engaged in the change process in order to realign their personal mental models). 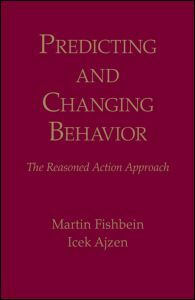 Theories of change build on the models of behaviour to explain how and when change happens. 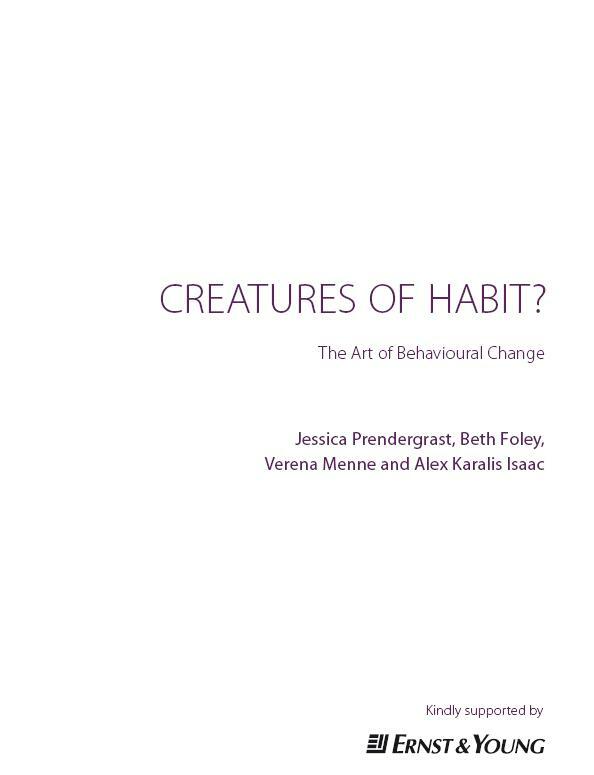 The Practical Guide: and overview of behaviour change models and their uses broadly categorises the theories as change in habit; change in stages; change via social networks; change as learning; and change in systems. Theories around change as learning are worth particular consideration due to the prevalence of ‘community education and engagement’ interventions by local governments in Australia (for example, workshops and seminars). Vare and Scott (2007) present a theory on education for sustainable development (ESD) that looks at two complementary approaches: ESD 1 and ESD2. They note that: “sustainable development, if it is going to happen, is going to be a learning process – it certainly won’t be about ‘rolling out’ a set of pre-determined behaviours” (2007, p192). The two approaches are described in the table below. The approaches are seen as complementary. Outcomes are the extent to which people have been informed and motivated, and enabled to think critically and feel empowered to take responsibility. The dominant approach of ESD 1 needs to be augmented by a participatory learning approach for long term sustainability. Interestingly, Vare and Scott deem social marketing as an ESD 1 approach, though it is our belief that this depends on the application of social marketing. Well researched and applied community based social marketing should lead to the critical thought and actions required to change towards a more sustainable lifestyle. In terms of measurement, Vare and Scott note that evaluation needs to go beyond the impacts on resource use, and capture the outcomes in terms of people’s motivation, ability to think critically, and ability to take responsibility for change. Frameworks for change are the practical implementation of theories of behaviour and models of change. Below we present three popular frameworks, Community Based Social Marketing, The Seven Doors model, and Persuasive Communication (TORE Model). The three models are not mutually exclusive. For example, CBSM provides a clear method for scoping which behaviours to target, and identifying the barriers to change, as well as the benefits. The tools of change presented in CBSM include making change convenient, social norms, and communication. The Seven Doors model highlights the importance of peer networks and influential others as a means for effective communication and a way to develop new social norms. Persuasive communication provides a framework to develop strategic communication so that once real and perceived barriers to change are overcome, a person is motivated to change behaviour. So a successful behaviour change project is not about choosing one framework, but understanding the components of the frameworks below and how they can be applied to your context. Community Based Social Marketing (CBSM) is a framework that is increasingly being used by organisations and governments to change behaviour. The CBSM framework is a sequential process that identifies behaviour(s) to change, and then requires research to uncover the barriers and benefits related to the new behaviour(s) and the existing behaviour(s). It is only then that tools of change are matched to overcome the barriers, and amplify the benefits of the more sustainable behaviour being promoted. In this, it is important to note that barriers lie with specific activities that make up behaviours (for example, composting is a behaviour that is made up of many activities- buying a bin, knowing how to set it up, knowing where to site it, having a container to put organic kitchen waste etc). It is also important to note that barriers are not homogenous to groups, so it is important to segment the population into target groups of like-individuals (for example, by socio-demographic, or gender). Once tools are identified, a strategy is matched to the tools. CBSM places great focus on the extensive research work associated to uncover barriers to behaviour change, as well as on the sequential process that places the design of the strategy (for example advertisements, home audits, workshops) as the final piece of the puzzle before piloting the strategy. The difficulty (and also the rigour) of CBSM is that it relies on extensive research prior to determining a strategy. It focuses on very specific behaviour(s); the more behaviours that are targeted (eg. purchasing renewable energy, switching to energy efficient lamps etc), and the broader they are (energy efficiency, greenhouse gas reduction), the less successful the behaviour change is likely to be because the barriers to the multiple behaviours will be numerous. Thereby the focus of the intervention is lost and the ability of people to change is diminished (people are less able to change multiple behaviours at one time). Circumventing the sequential process of research and design for expediency has implications on the evaluation of behaviour change. For example, it is possible that the evaluation method is attempting to attribute change to a variable which is not effective, or that the evaluation focuses on specific variables without regards for external effects or unintended consequences. For an example of research undertaken as part of the CBSM process, see the Community Survey Findings report as part of the Townsville Residential Energy Demand Program (Townsville: Queensland Solar City). The Five Doors model developed by Les Robinson, provides a framework for change at the community level. The model determines that change occurs at the collective level through social diffusion or peer contact, rather than at the individual level. Robinson uses the analogy of a behaviour change facilitator firing arrows packed with information and facts randomly at the target population in the hope that the arrows will hit their mark. In this approach, there is a ‘change space’ (willingness to receive and act on change) that every person is in and different behaviour change processes influence people according to their change space. Through surveys, Robinson determined what prompted people who had made significant and long term changes in their lives. 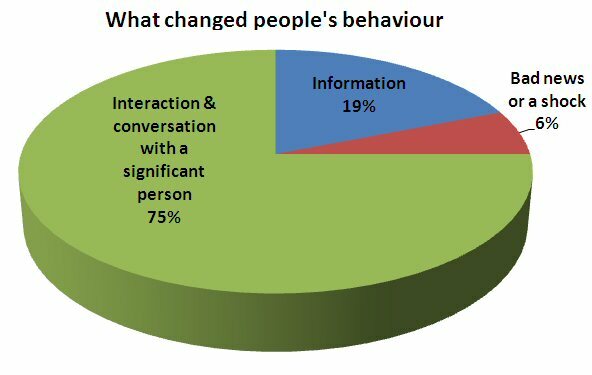 It was found that 19% received information arrows, 6% received bad news or a shock; and 75% interacted with a significant person and a critical, behaviour changing conversation occurred. Given the above change space information, the arrows of information that we often send out randomly to the public, family or friends are not useful. We really need to be out there having conversations with people, interacting and making connections. This has important implications in terms of how we attempt to facilitate behaviour change, given that only one quarter of our audience may react to information packets or bad news stories. Spending time with people explaining new systems and answering questions about a behaviour change process seems like a logical way to increase behaviour change in that environment. Professor Sam Ham has developed an approach to behaviour change that is focussed on persuasive communication called the TORE model. TORE stands for Thematic, Organised, Relevant and Enjoyable, but more about that later. 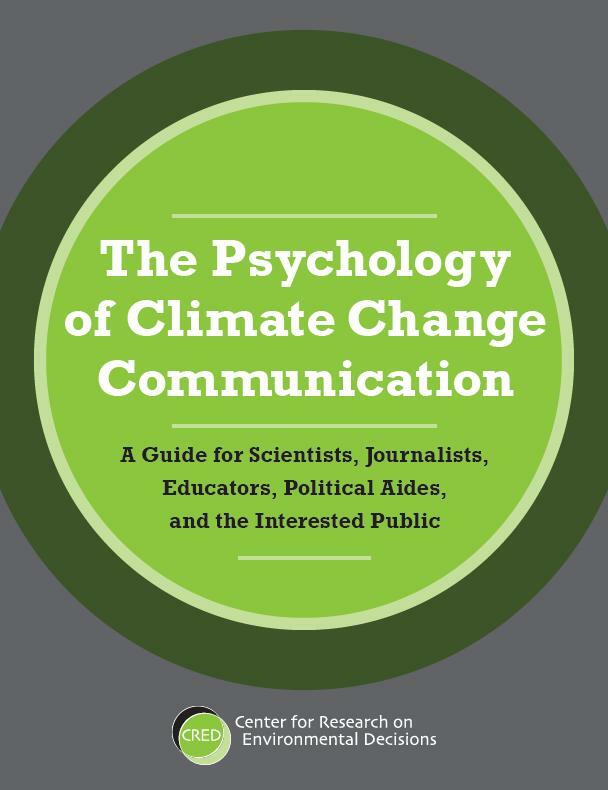 Persuasive communication is about getting people to change their behaviour towards more sustainable (or preferred) options through the use of strategic messages based on understanding the difference between the people who already do the preferred behaviour (compliers) and those that don’t (non-compliers). The premise is that removing barriers to the desired behaviour is not enough, you must also get people to ‘want’ to do the behaviour (or in other words, you can get the horse to water, but you may not get it to drink!). Persuasive communication has its background in a couple of psychological models- the Elaboration Likelihood Model (ELM) and the Theory of Reasoned Action. Very basically, the ELM proposes that people’s behaviours can be influenced through two pathways, a central “effortful thought” one that leads to a greater likelihood of sustained change, and a peripheral pathway that leads to short term changes in behaviour. The peripheral pathway doesn’t get people to think about the message, but rather uses superficial qualities such as celebrity endorsement to influence behaviour. This is often the process used in marketing. An example of this peripheral route is a recent study that showed that celebrity endorsement influenced parents to purchase junk food. To achieve successful persuasive communication, you need to find out what is significantly different between the beliefs and attitudes of known compliers and non-compliers. Once you know the difference, you can craft a message to get the change towards the desired behaviour. An important thing to know is that a more successful message will emphasise reasons in favour of doing the desired behaviour (ie. 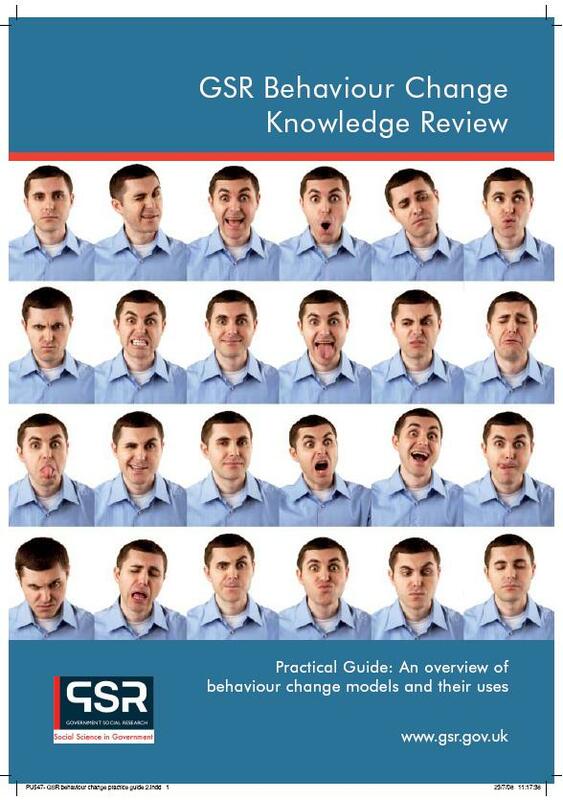 why it is good to do the behaviour) rather than why doing the problem behaviour is bad (eg. don’t do this because…). This leads to Sam Ham’s TORE model of persuasive (or thematic) communication. The TORE model states that effective communication is not achieved by presenting general facts and figures to the audience in order to get them to think logically and rationally, but rather presenting a message that provokes them into ‘thinking’ (or as the ELM stated, creating ‘effortful thought’). As such, the message has to be centred on a theme that provokes people to pay attention and process your message. Themes are linked to beliefs, so a strong theme is important. It is also important that the message is relevant to people (ie. meaningful and personal to what they already care about). The message must also be enjoyable and organised so that even an audience that isn’t obligated to process the message will choose to do so. In comparison, think of brochures or posters that you have seen where you can’t recall the desired behaviour being targeted due to the amount of information that is provided. 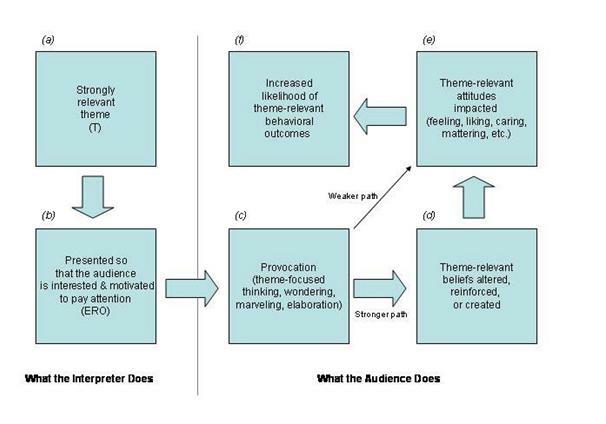 In the best-case (“stronger path”) scenario, when an interpreter’s theme is strong (box a) and s/he delivers it in a way that motivates the audience to focus on it and process it (box b), it provokes the audience to think and make meanings related to what is being presented (box c).1 Depending on how well these meanings fit the people’s existing beliefs, reinforcement, change or the creation of new beliefs will result (box d). The new status quo can, in turn, influence the people’s attitudes (i.e., what they like, dislike, or care about) with respect to the theme that was developed (box e)2. If these attitudes are strong enough, we would expect them to lead to behavioral choices that are consistent with them (box f).3 If an attitude was the result of a lot of provocation, it would be stronger, more enduring, and more predictive of future behavior. However, if the attitude occurred as a result of less thinking, it would be weaker and shorter-lived, but possibly still predictive of behavior in the immediate time frame. This possibility is shown by the small (“weaker path”) arrow directly connecting box c to box e (and bypassing box d). Professor Sam Ham has developed an approach to change focussed on persuasive communication called the TORE model. TORE stands for Thematic, Organised, Relevant and Enjoyable, but more about that later.